So how about the second time I tried? Well, this time round I managed to finish it. The story is set in two different eras. The first is a sort of post-apocalyptic world where much of England has been flooded. There are few disparate Isles, each with their own population. Our story focuses on the inhabitants of Ham (meant to be Hampstead). The other is set in the late 20th and early 21st century, focuses on the life of a London taxi driver, Dave Rudman. Though it is not made explicit in the early part of the text, it may be inferred from it, as well as from this and other reviews you may read, that Dave wrote some words of advice to his son, who he rarely got to see, after a custody battle. These words of advice were found, many years later, after the apocalypse and have formed the basis of a new religion. So in short, it is a satire about both religion and the banality of modern life. The pace of the book is somewhat slow, with even the timelines of each story being non-linear. In this respect, it seemed as though Self was trying to copy the style of One Hundred Years of Solitude though this was not nearly quite so confused as Marquez’s bizarre tale. The other book that I could not escape analogy with was The Handmaid’s Tale, as the back story which provides the backdrop is only slowly revealed, almost necessitating a re-read just so that you get the background first and then the ‘real’ plot second. But Self is content to muddle the two up. But it just about works. Just. But what’s all about, really? Well, once you dig through the language and some of the more turgid passages, there are a couple of worthwhile stories to be discovered. One of these stories is that which looks at the nature of religious fundamentalism. The future society has based its rules on a single book that was discovered, regardless of its origins. It has developed its own traditions based not on anything truthful, but of the rantings of a mentally disturbed man on the wrong side of a bitter custody battle. Yet when he was better, he wrote a second book, recanting much of what said before. So what happens when this second book is later discovered, once the traditions of the first have been entrenched? Well, you can probably have a guess, but I’ll let you have a read. The other story is a critique of modern life in working class London. Or at least, how Self envisions the working class. At the time Self was writing this, Fathers For Justice were frequently in the news for their public stunts dressed as superheroes as they fought for equal rights when it came to custody of their children. The book follows the failed relationship that Dave has which ends up with him joining a Fathers For Justice type group (though it is not named as such, it is unmistakable) trying to get to know the Lost Boy and give him some fatherly advice. As indicated above, it’s by no means an easy book to get into. But once there, just how good or bad is it? Well, I’m glad I read it, though I don’t think it’s everyone’s cup of tea, especially if you’re offended by coarse language. When I reviewed Cloud Atlas, I compared one section of it to The Book of Dave, which I described as “truly terrible”. I now that that epithet was too severe. It’s by no means the finest work of fiction ever written, and it hasn’t left me searching the bookshelves for another work by the same author. But if the idea of a London-centric post-apocalyptic world based on the rantings of a taxi driver appeals to you, then go right ahead. This was Huxley’s follow up to his much lauded The Doors of Perception. The volume I got actually contained both books, though I decided to review them separately. I hope you don’t think that’s cheating. The book carries on very much in the same vein as Doors, with its mix of visual experience, mysticism and mind-altering drugs. As with the earlier book, it’s difficult to write an ordered review as the book is not all ordered. It would be unfair to characterise as a stream of consciousness, though that would be at the end of the road which Heaven and Hell starts to walk down. What it is, is fascinating and thought-provoking. The fact that it meanders around without making any points may frustrate many readers, myself included. It’s a bit like walking around a landscape without any paths with a guide who keeps pointing out random features. Some you will find interesting, some you won’t. So in spite of its brevity, the book is a rich source of material that one could take and write about. Because of this, I cannot write at any length for to do it justice would require taking every third paragraph and writing an essay dissecting it and exploring the avenues it points down. Some of its most interesting points are, in my opinion, those relating to ‘religion’. Anyone who has read Charles Foster’s Wired For God may recall a few references he made back to Huxley’s work. Indeed, anyone who has read and enjoyed the more ‘religious’ aspects of this may well want to read Foster as a follow-up. One point to emphasise (perhaps unfairly) is that Huxley points out the shamanistic origins of liturgy, a point I have often made but which has fallen on the deaf ears, or otherwise aggressive defensiveness, of high church traditionalists. But I’ll let you discover that for yourself, along with a host of other well-articulated, thought-provoking insights. You might not agree with it all, but it’s well worth having a peek. When you have invested much of your life into something, it is bound to have an emotional effect if, or when, someone attacks it. Some attacks may be warranted; some may even be done with a measure of grace. Unfortunately, neither of these is could be said of Giles Fraser’s spiteful attack on evangelical christians which was published in the Guardian recently. His misleading caricature on evangelical christians (or as I prefer to call them, christians – see here for more on what I mean by the term evangelical) seems, at the start, to be based on school assemblies he has with the under 5s. That, combined with the picture of Ned Flanders, did not bode well if this was meant to be a well thought-through, reasonable piece. “This is what evangelicals call “a personal relationship” by which they mean that Cheesus [sic] has become their boyfriend or best mate,” writes the anglican minister. Now I have met a handful of christians who might loosely, if somewhat mean-spiritedly, be described as holding such a view. They are, however, a tiny minority and may make up no more than half a dozen or so out of a medium-sized congregation of hundred or so. In this regard, there is a grain of truth in what he writes. But a grain of sand does not make a beach. To take such a viewpoint and apply it to a wide spectrum of belief is both unfair and unreasonable. Indeed, as I sat at my table to write this response I got rather stuck, given the variety of views that I have come across from evangelicals from a number of different denominations over the last three decades. As such, I can only write this from the perspective of one evangelical, me. Others may agree with what I have to say, some may disagree. That is the very nature of being a non-conformist and a result of free thinking. So is Jesus my best buddy? Of course not, but there is an element of truth in the personal relationship theme. Because of Jesus’ actions at Easter, both the crucifixion and the resurrection, humans can be put in a right standing with relation to God. This idea is generally known as justification. Though the relationship is not really that of a boyfriend or best buddy, more like the relationship a child has with their parent. That said, it may still have aspects of friendship within it. John 15 records Jesus speaking to his disciples as his friends. Does this extend to his modern-day disciples? Maybe. James 2:23 refers to Abraham as a friend of God. Was that reserved for Abraham, or might it be possible for us? Possibly the best exposition of our relation to God is given in the book of Hebrews, where the writer describes the priesthood of all believers, with Jesus as the high priest, though I’ve written on this before if you want a fuller discussion. There is not a little irony with Giles Fraser’s use of the term, ‘Patronising, superior and faux caring all at the same time.’ The first two could certainly be applied to his own article, although not the third as he seems to care even less about needlessly offending people than he does about portraying them accurately. He states that ‘Rowan Williams never spoke of Cheesus [sic].’ Given Giles Fraser’s peculiar portrayal of ‘Cheesus’ this may well be right. However, even though such a simplistic viewpoint of christianity may exist, it is by no means the prevalent view, so not many evangelical christians, let alone the ministers of such churches, speak of Cheesus either. To judge all evangelicals on the basis of one or two who portray slightly lax thinking would be to judge all anglicans on the basis of one minister I encountered whose sermon consisted of reading the newspaper headlines and telling the congregation ‘As christians, this is what we ought to think of such-and-such.’ Nor would I base my view on my time at university, when our college chaplain, who was also canon at the local cathedral would only such much as allude to Jesus but never speak openly of him, let alone give an exposition of a passage of scripture. To him, Jesus was a figure that it was assumed all would know fully. Any sermons consisted of looking at pieces of art and talking about vague ways in which the art “reminded” us of a few aspects of Jesus’ character, though that never involved his turning the tables on the money changers or the one who endured agony on the cross. That was not the Jesus the chaplain preached about. Though such people exist, even in positions of seniority in the church of England, it would be unfair to characterise all anglicans as such. Indeed, as the chaplain was canon at Durham cathedral, it is likely that he knew the new archbishop of Canterbury, Justin Welby, and his predecessor at Durham, Tom Wright, both of whom have been labelled at one time or another as coming from the “evangelical” end of the spectrum. This brings me to the next point of engagement: Giles Fraser’s claim that to regard the cross as a moment of victory is “theologically illiterate.” Yet if the case can be so simple and accurate at the same time, then to do so would result in regarding Wright as such. After all, did he not write Jesus and the Victory of God which made just this point (in particular pages 592-611)? Though he may not be to everyone’s liking, it would be a brave man indeed who might call Wright theologically illiterate. That said, as before, there is a modicum of truth in what Giles Fraser writes. If one were to solely view the cross as a moment of victory, then a vital aspect of Easter may be overlooked. Yet it would be equally wrong to ignore any aspect of God’s victory, pretending it didn’t happen. The cross was undoubtedly an event of great suffering. Different people have different emphases on this suffering. You can you usually tell a catholic cross because the figure of Jesus will still be present on the cross. Those from a more protestant church will have the cross empty, perhaps focusing more on the resurrection. I may well be in the minority of evangelical christians who have read Moltmann’s The Crucified God, where the idea of God suffering is explored extensively. Though I’m not sure it’s required reading in high church anglicanism prior to confirmation. Whether we emphasise the suffering of the crucifixion or the joy of the resurrection, the two lynchpins of Easter ought not to be divorced from one another. Indeed, in 1 Corinthians, Paul opens his letter by talking of the power of the cross and declaring that he “decided to know nothing among you except Jesus the Messiah and him crucified.” Yet the natural progression of the letter leads him to climax the letter with chapter 15, perhaps one of the greatest expositions of resurrection theology and what it means for the world. Perhaps one might consider engaging with just a few (out of many) books written on the subject of dealing with pain, tragedy or loss. Surely, if any writer is more likely to be found on the shelves of evangelicals, it is C.S. Lewis, author of The Problem of Pain and A Grief Observed. Or for looking at the subject of unanswered prayer, I’d highly recommend God on Mute. There is scant little of Cheesus in this work, even opening with a note of exasperation with some fellow evangelicals. Oh, by the way, the author, Pete Greig, happens to be on the staff at Holy Trinity Brompton, an anglican church which Giles Fraser seems to have, at best, deep suspicions about, or at worst, a disdainful phobia. With the instalment of the new pope and the archbishop of Canterbury, religion has been near the top of the news a lot recently. Whether you like it or not, it is a topic that interests people. As a non-conformist evangelical, being neither a catholic or an anglican, I have been hoping that these two leaders who have the ears of much of the world might be able to use their positions to faithfully declare the gospel. I don’t think they’ve made a bad start. Both catholic and anglican churches have their problems, which people love to focus on; but so do many other churches from other denominations who don’t command the same level of press coverage. Christians of all denominations need to be faithful to the gospel and present Jesus as accurately as we can to the rest of the world. Then people can make an informed decision as to whether to accept or reject him and his message. Caricatures of Jesus, whether peddled by evangelicals or high church traditionalists, are not helpful. Theology ought not to be about publically bashing those we disagree but about studying the logos theou – God’ word, working to understand what it means and its implications, listening to one another and to the voices from the who have engaged with the same questions. A church without theology is baseless and a theology without the church is pointless. Having stated that I intended to look at the theology of hell, this was my first port of call. The book is predominantly written by Francis Chan, as is stated fairly early on. Preston Sprinkle did some more of the research that went into the book, but Chan’s voice is the one that dominates the narrative. The opening of the book is an odd mixture of both the sound and the conservative. Whilst the authors sometimes run along the line of thinking that I outlined in my introduction, they also seem to make quite a lot of unjustified assumptions, such as biblical infallibility. What also emerges fairly early on is that this is largely, though not wholly, a reaction against Rob Bell’s Love Wins, a title I intend to read as part of this current study, but have not yet picked up. A) Universalism stands in opposition to the traditionalist idea of hell as physical place of eternal torment and punishment. C) Therefore the correct picture is that hell is a physical place of eternal torment and punishment. For instance, one of the aspects of a study of hell I was looking for was the use of certain terms. While their look at Gehenna is very interesting and threw in an angle I was previously unaware of (namely, that the earliest reference to it being a rubbish dump wasn’t until AD/CE 1200). Yet they all too quickly jump, without reasoning, to interpret Gehenna as hell. Yet the treatment of Sheol is so brief it is shoddy, whilst Abaddon and Hades barely get a look in, particularly with the latter’s link to Greek mythology being ignored entirely. 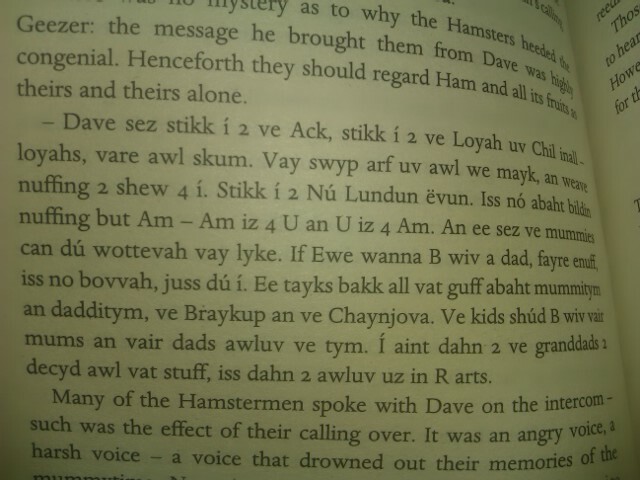 The tone of the book is incredibly patronising at times. Here’s just an example: “How can I believe these passages yet sit here silently? I know some of you have faced this same conflict. Even as you’re reading this, there are probably people within a few feet of you who may also be going to hell. What will you do? It could be that the Lord wants you to put the book down.” With such annoying passages as that littering the book, I certainly couldn’t recommend it to any non-christian friends. I would also hesitate to recommend it to any christian friends as it is far from a detailed, thoughtful exegesis on a highly important topic. It is very telling that the authors only refer only to conservative writers, paying little no attention to voices that detracted from their own view. Yet I suppose that leads fittingly to my conclusion on this book. If you want to investigate the theology of hell then this is essential reading insofar as it is a good example of one line of thinking, but it is far from being an holistic or thorough account. It is an ideal example of an appeal to tradition masquerading as a biblical study; a thoroughly conservative eisegesis. By the time you’re reading this, I should have arrived back in the south of England, after having been a passenger all day in the back of someone’s car as we drove back from the western Highlands of Scotland. 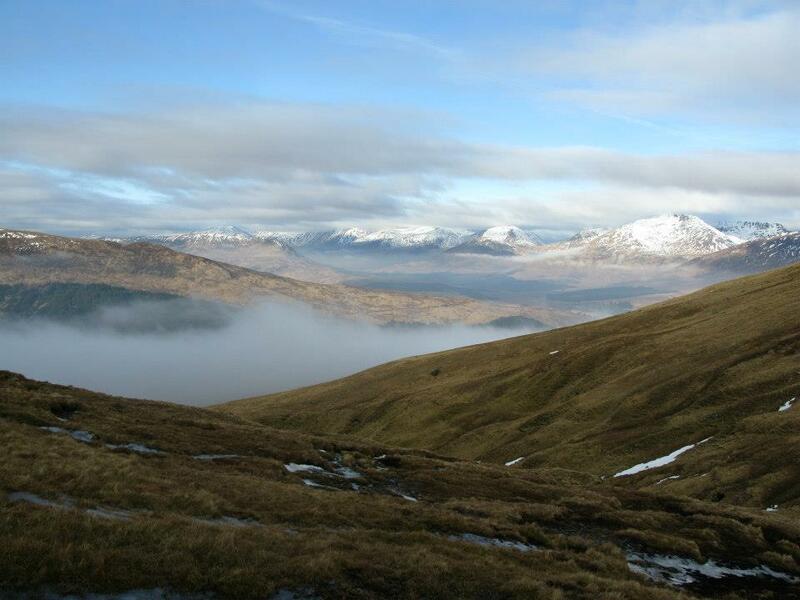 We based ourselves at the By The Way hostel in a little village called Tyndrum, north of Loch Lomond. A word needs to be said about the cast. I got a phonecall from my uncle a couple of months ago, asking me if I’d like to go ice climbing with him and some of his friends in Scotland. Most of them were going to be around his age (mid 60s) and there were going to be a couple of their grandsons with them, which he mistakenly thought were my age, though they were some way younger than me, in their early 20s. Because we had a long drive ahead of us, we needed to set out early. So, after arranging a lift with some guys who lived nearby, I stood outside my front door at 6am on a Monday morning, to be greeted by a couple of older chaps, one of whom would not be out of place playing Fagin in an adaptation of Oliver Twist. With the exception of my uncle, I knew nobody here, but they all knew one another. So from the outset I was going to be the outsider. We had a fairly easy journey for the first part until the M6 was shut near the border between Lancashire and Cumbria. We later got stuck in rush hour traffic whilst going through central Glasgow. The last of our party to arrive were held up as they had broken down and had to get a hire car. But we were all in place by about 10:30 in the evening, just in time for bed. When we got up on the Tuesday morning, those who had been last to arrive assumed leadership for the trip. They were going to plan where we went. Instead of easing us in with a gentle day’s hillwalking they took us straight into the mountaineering. They wanted to do a Munro called Ben Challum. It was by no means the highest mountain I’ve ever done. My personal record is about 6,500 feet, though this was less than half that. But Scottish mountains are different beasts. For every 50 feet you rise, there’s a drop of 10-20 feet the other side of a bump. We started off with 9 of us heading up. After little more than an hour of firm, but not too difficult, ascent one of the chaps turned back. He wasn’t feeling particularly well and actually went home the next day. We carried on for about another hour and a half before we lost a second member of the party to fatigue. The higher up we got, the more snowfields we encountered. Where I’ve encountered these before, there was enough latitude to traverse around them, but here we had no choice but to cross them. The weather was spectacularly good, which actually created its own problems. The sun was shining, though it wasn’t terribly warm above 1,000 feet which allowed the very top of the snow to gradually defrost during the day but then it would freeze overnight, hardening it and making it quite hard to get a grip on. Some of the snowfields had become just sheet ice and we didn’t dare set foot on these. A couple of people did so by accident and they quickly fell over, nomatter what footwear they had. One of the tricks that mountains play on the climber is that very often you think you can see the summit when in fact all you can see is an area where the mountain levels out for a bit. As you approach it, it still looks like the summit, but just as you get to within 10 feet or so, you see another part of the mountain behind it. This happened quite a lot. After about 4 hours of climbing, we eventually made it on to the final snow field and make it to the first summit. Of the 7 members of the group remaining, 5 more went on to the second peak a little further along. This required 8-point crampons which I didn’t have. Having forked out several hundred pounds on new clothes for this trip (I’ve never needed very thick outdoor clothes before, nor an ice axe) I went for budget crampons. I got what I paid for. Within 5 minutes, they buckled and bits started falling off them. The descent was a fair bit quicker than the ascent, though one of the guys twisted his knee a bit. I went down at a steady pace. There was a group who wanted to race down while the group with the slightly injured guy went down quite slowly. I was trying to keep both groups in sight, one ahead, one behind, though as we started to get down to a more gentle gradient, the faster group sped up immensely, while I was starting to get a little dizzy. It was a pretty tough first day. Had I been in charge, I wouldn’t have chosen quite such a high peak to start with. But I managed OK. I was as fit as I thought as I was, though not quite as fit as the fastest group who were able to keep up a very high pace both up and down the mountain for long periods of time. On the second day, the pair who were deciding where we were going had their eye on another pair of Munros. The trouble I found with them was that while they were vastly more experienced than I, I could trust their judgement in where to put one’s feet, but they could not be relied upon for a reasonable estimate of how easy or difficult a hill was. Considering that only 7 out of 9 made the first peak, which was 3,000 feet high and in places required a vertical climb, I thought it was pretty firm. If I were to rate it, I would say that was 3 out of 5 difficulty. Yet one of the guys, a very posh chap, was quite demeaning afterwards when he said that this was “just a bit of gentle hillwalking”. Now, I’m a fairly experienced hillwalker. The idea is that beyond a pair of stout boots, you don’t need any specialist equipment. You walk up a hill, with an ascent not much more than hour, before walking along the top of a ridge, tracing the contours which, though undulating, average out at being fairly flat. Also, you don’t tend to need to get on all fours in order to get up. So I decided to leave them to their own devices and have a day that was slightly flatter. The hostel was right on the West Highland Way, so I decided to set off and walk a stretch of it. Because of the terrain, it was impossible to make a circular walk out of it, so I just walked northwards along the path for 3.5 hours before stopping for lunch and turning back. It was a vastly enjoyable day with some great views, though I covered around 18 miles in total, so was quite tired by the time I got back. The evening brought its own source of tiredness. Those who know me know that I live alone. I value peace & quiet and find the company of others for extended periods of time to be extremely draining. Yet amongst the people who were staying there were some who are at the very opposite of the spectrum to me. There was endless talk into the evening. I suppose what it made it worse was that most people there had known each other for years, either through previous mountaineering experience or because they were part of the same family. I felt very much the outsider, looking in, listening, but unable to contribute; though I doubt I’d have been able to get a word in edgeways had I tried to do so. This is why, after dinner, I was always the first to volunteer to step away from the table and do the washing up. After all, I do the washing up at home every day, but it was a luxury to have someone on hand to do the drying up, which I always do anyway. Then there were the night times. Of everyone I have ever slept with (in the most literal, not euphemistic sense), not one has ever complained that I snore. I have never woken myself up snoring either. Therefore, I am reasonably confident that I do not snore. The same could not be said of the 3 other blokes I shared a dormitory with. The youngest started as soon as he fell asleep. The eldest began his reign of terror in the couple of hours before he woke. The other chap took charge of the small hours after midnight. So being physically tired and with little sleep, I set out on day three, when we all reunited to climb another peak. I was able to be some help, as the foot of the mountain was along the path I had walked the day before. It started relatively easy enough. We were walking up a frozen peat bog, so while it had potential to be very muddy underfoot, it was firm enough to just have a little crunch underfoot. In a few places, the streamlets coming off the hill went over rocks which, having frozen, made them quite slippy. But the first 1,500 feet or so were ok for anyone of a reasonable level of fitness. The only thing that made it potentially hard was the speed at which some of the members of the party wanted to move at. Weather-wise, it was the worst of the days we’d had so far, though it was still pretty good. We ascended through a layer of thin cloud but we had no problem with visibility, nor was there any prospect of snow falling anywhere in the vicinity. However, as we got higher, the snow that was already lying was getting more and more concentrated. We tried, where possible to navigate round the snowfields, though this necessitated scrambling over rocks that had ice on top of them. So we were constantly having to stop and reassess our route, with different members of the party opting for their own routes. I was quite pleased with my judgement as I never took a wrong turn. 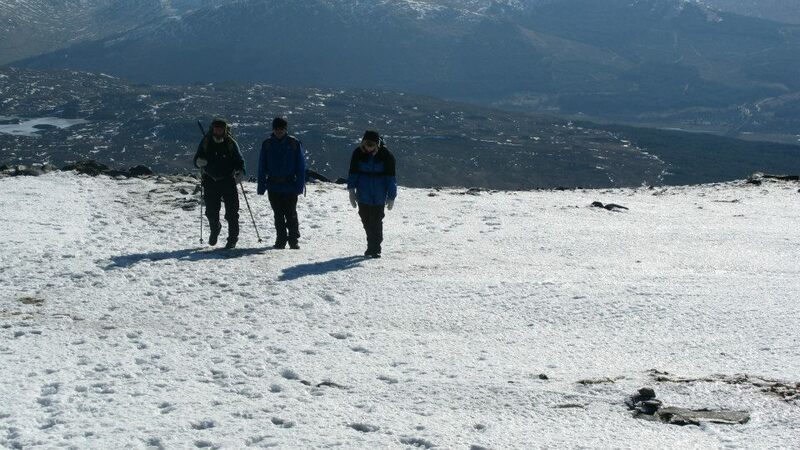 One chap did, deciding to go up the right hand side of a snow field when I was going up the left. He fell about 5 or 6 feet and sustained a bit of a bruise on his leg. But when I saw him lose his footing, my heart was in my mouth for a moment. Had he fallen in a less controlled manner than he did, he could bounced a hundred feet or so back down the rocks. Seeing someone else have a fall probably dented my confidence a little. One of the first rules of mountain climbing is to have respect for the mountain. In the week we were in Scotland one person died on Ben Nevis. Recently, we read that a man and his son died whilst hiking near Mont Blanc. So it might not come as a surprise to you that I took my respect seriously enough to turn back before I reached the top. After this other chap’s tumble, we ascended another couple of hundred feet and the amount of snow increased. There was no choice but to ascend the ice field, which I reckon was at about a 60 degree incline. I didn’t have proper crampons so I was climbing by throwing my ice axe into the snow above my head and trying to kick steps into the snow at my feet. But at one point I got stuck. My feet were forced together so I didn’t have much balance. But I had grip. Yet as soon as I moved my left foot outwards and upwards, I couldn’t get any grip. To stretch out far enough I’d have to sacrifice any remaining balance that I did have. Without the combination of balance and grip, and with a pretty steep icy and rocky slope beneath me, I made the choice to retreat. I didn’t want to. I wanted to get to the top, to be able to say I’d conquered a peak, to see the view out for mile upon mile. But it wasn’t to be. Not for me. Not then. I hope that someday I will be able to return in summertime conditions and have another go. I know where the mountain is and I don’t think it’s going anywhere. We can wait for one another. Having failed, I didn’t fancy another failure the next day, so I decided not to join the others in the final full day. 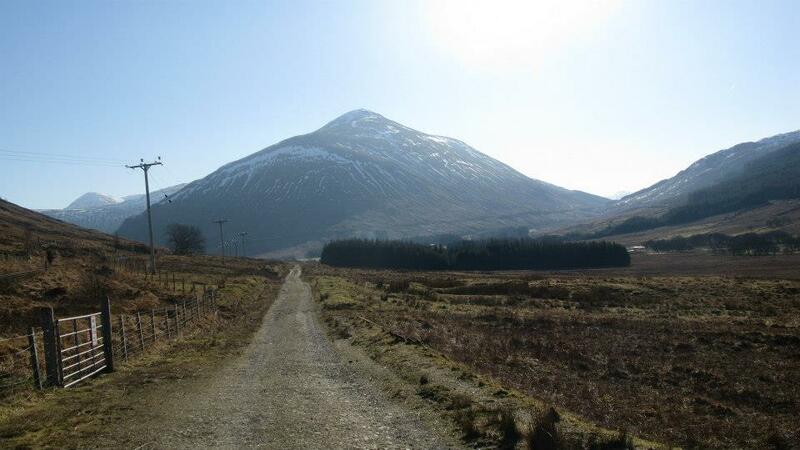 I returned to the West Highland Way, this time setting out to walk south instead of north. I didn’t quite so far as I did a couple of other days earlier. I had anticipated a flatter route, though I miscounted the number of contour lines on the map, meaning that I was going rather more vertical than I had intended. I wouldn’t have categorised it as climbing but it was certainly a good bit of strenuous hill-walking. But by the time I had turned around to start the journey back to the hostel, I was ready to go home. I still need to get a fair bit fitter; it’s hard to find the time to do when you’re a working professional. I have time to read, stuck as I am on trains for upwards of two and a half hours per day. But exercise isn’t so easy to come by. Still, I’d scratched the itch of climbing that had been growing for the last couple of years. I may go back to some mountain range or another in two or three years’ time. I picked this up as “something else” book to read whilst I was on holiday. Unfortunately, I didn’t get much time to actually read it undisturbed as the hostel was rather noisy. As a consequence, I think this may be a candidate for a re-read in calmer conditions. I suspect, though, that were I to do so, I would still be as bemused as to how to write a review of it as I am now. It’s not that the book itself is terribly confusing. It is short, but it covers such a range of topics and in such brevity that I found it hard to get my teeth into. Just when you start to get to grips with it, it ends. At only 50 pages long, it is more of a pamphlet than a work of non-fiction prose. If you are unaware, the basic premise is this: Aldous Huxley took a mind-altering drug and describes the results. One should not think, however, that the book was written whilst Huxley was under the influence of the 0.4 grams of mescalin that he took. Rather, this was written in retrospect, relying in places on answers recorded by a friend who he was with during this time. Huxley does become something of an apologist, or even an evangelist, for the use of mescalin, arguing that it has much fewer drawbacks than even alcohol or nicotine. He describes how things become much more vivid, though there is no loss of cognitive functions. Hence, he feels that our evolution has filtered out things in the world which readily exist, but which the use of narcotics open up to us. One of the strongest parallels Huxley draws is with religion. I wasn’t aware that this was such a significant factor as I was planning on taking a short break from any “religious reading” for a week, though the parallels that Huxley draws are very interesting. He is level-headed enough to dismiss the suggestion that reasoned theological thought should be equated with any drug-induced experience, but he does suggest that both offer insights into realms beyond our everyday comprehension. That’s not to say I agree with him, but it is quite thought-provoking. In writing this review I will confess that I have been a little lazy as I have not followed up on Huxley’s claim that mescalin and LSD are less harmful than other drugs. I think it likely that there has been subsequent research but I have not reviewed the relevant literature. Nonetheless, as a stand-alone piece I can readily see how this may have influenced the “hippy” movement in the years following the book’s original publication. As regular readers will know, I use this blog to put words to the voiceless thoughts that mill around my head. By trying to get something down on pen & paper (as many of my posts originate there before being transcribed and edited) I can critique my own thoughts and try to evaluate if what I am thinking makes any sense. Of late, I have been thinking a little about the idea of hell. I guess it was properly sparked off by reading Hitchens’ diatribe, God is Not Great, where amidst his irrational ramblings against religion he does make a good point that the idea of hell is used as an evangelical tool to try to “scare” (for want of a better word) people into belief. This is something I recognise, most frequently among street preachers you occasionally see dotted around London. Another part of it may well have been how much I disagreed with Tom Wright’s thoughts on the subject in Surprised by Hope. The fact of the matter is that the idea of hell makes me uncomfortable. The traditional idea which has seeped into the public consciousness is a deeply disturbing image of fire and eternal punishment. If any group of people are good at capturing the zeitgeist, it is animators. If you watch comic depictions of hell in The Simpsons or South Park you will find a common theme around which they are based (although each usually has their own amusing twist on it). The idea also makes other christians uncomfortable. When, many months ago, I mooted the idea of doing some investigations into the idea by reading and writing about the subject, I was frequently either warned off from doing it or advised not to look too closely. Of course, not all responses were like that, but a noticeable number were. The only trend I noticed was that those most opposed to this undertaking were those at the more ‘conservative’ end of the theological spectrum. So what is the correct way to proceed? Should I drop any investigation into the matter, thinking that I know and understand everything there is to know about hell and then keep it at the back of my mind? If I’m asked “do you believe in hell?” how should I respond? Will it be a simple “yes” or “no” or should there be a clarification about what the questioner has in mind when they ask the question? I study in order to do battle with ignorance. When that battle is over, the peaceful aftermath allows for a faithful out-living of what I have learned. The christian life lived without an understanding of theology is ignorant and misguided; yet the pursuit of theological correctness, if not followed through with practical application is a purely academic study, helping no one. As such, I cannot heed the advice of those who would warn me to stay away. If I am to be a faithful christian, I can’t decide that there are areas which mustn’t come under scrutiny. What if I’m wrong? One of my major concerns is that the idea of hell has been hijacked, subject to later reinterpretation and then fed back into the christian psyche so that what is preached as “the christian view” of hell is no longer based firmly in what may be found in the books of the bible. In particular, I am concerned about the influence of Dante’s Inferno episode of the Divine Comedy. To some extent, Milton’s Paradise Lost may also come into play. So in anything I read, I will look out for any authors who approach the subject seeming to come with a pre-formed vision of what hell is, if indeed it is anything. This exercise is largely to sharpen up my thinking which is, I freely admit, a little woolly on the matter. But I think it is worth stating where I am starting from. My position has been for some time, best described by the term ‘tentative annihilationist’. That is, I subscribe to the idea that hell is the destruction of the soul; you simply cease to exist. This is set apart from two other main schools of thought: the traditional idea of eternal torment stated above and the idea of universalism, that everyone will saved and no one would go to hell. As lovely as that final idea sounds, it seems to be borne out of little more than wishful thinking. I’ve never yet read a reasoned argument in its favour. As hinted above, I am also sceptical about the eternal punishment theory. The reason is that there is so much in the bible that refers to destruction far more than torment. Even what is said about we might think of as ‘hell’ seems at odds with what little is spoken about in churches. So what is my plan for going forward? Well, as usual, my primary means is reading books. At the time of publishing this, I expect to be about half way through Erasing Hell by Francis Chan & Preston Sprinkle. In order to get more a more informed opinion on universalism, I intend on picking up Rob Bell’s controversial recent book on the topic, Love Wins. Someone recommended to a book entitled something like A History of Hell though I forget the author’s name. If you have any recommendations, then please feel free to suggest them in the comments. There will be several features I will look out for in these. I may well follow up on my own if I don’t think they are addressed properly. Specifically, they will be about the translation and interpretation about the various terms used: Sheol and Abaddon (Hebrew), Gehenna, Hades and Tartaroo (Greek). Behind some of the words of caution I have received, there has been an undercurrent of thinking that by looking at this side of theology one must be ignoring the gospel of grace. I won’t be ignoring it, though I readily acknowledge it is difficult to look at both aspects of christianity simultaneously without going a bit cross-eyed, like looking simultaneously to the extreme right and left fields of vision at once. I’m sure there will be many other topics that cross my path as I go along, though I hope to gain the right balance between not getting distracted and not ignoring important, intertwined strands of thought. I’m not anticipating that this will be a fun or a pleasant trip. But like going to the dentist, it may be necessary. I just haven’t been to the dentist in almost 15 years and I’m not sure that’s the best state of affairs to be in.